Betting on BECCS: Will Bio-Energy with Carbon Capture and Storage Help the Climate? The biosphere (from Greek βίος bíos “life” and σφαῖρα sphaira “sphere”) also known as the ecosphere (from Greek οἶκος oîkos “environment” and σφαῖρα), is the worldwide sum of all ecosystems. It can also be termed the zone of life on Earth, a closed system (apart from solar and cosmic radiation and heat from the interior of the Earth), and largely self-regulating. By the most general biophysiological definition, the biosphere is the global ecological system integrating all living beings and their relationships, including their interaction with the elements of the lithosphere, geosphere, hydrosphere, and atmosphere. … In a general sense, biospheres are any closed, self-regulating systems containing ecosystems. (The importance of the lithosphere — litho, stone — will become apparent shortly.) When we say “climate change,” or “global warming,” or even the Jackpot, we are talking about processes that occur wihin the “closed, self-regulating system” of the biosphere, as opposed to forces outside it (modulo sunspots, comets, etc.). “Given our current knowledge, we can’t get to 1.5 degrees without removing carbon from the atmosphere and storing it,” said Kelly Levin, a senior associate at the World Resources Institute. 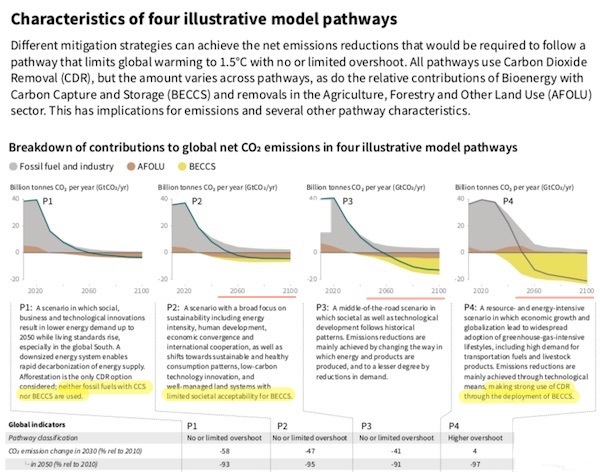 So, if you take these pathways as representative of IPPC recommendations, you can see that the IPCC, in every pathway but the first, is betting the farm — or rather, the biosphere — on BECCS. So, what is BECCS? 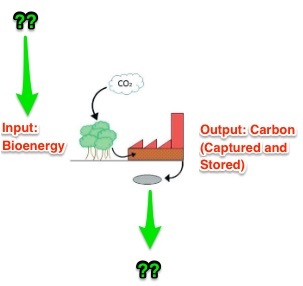 Bioenergy with carbon capture and storage (BECCS), a form of geoengineering, is the favored removal technology included in the [IPCC] model inputs. Bioenergy refers to the use of crops to produce energy when burned, such as wood chips from the forests in Louisiana being shipped to the UK to create electricity in the Drax power station. Carbon capture and storage is the process of stripping CO2 from the waste gases at the time of combustion and then compressing it into a liquid for long-term underground storage. Theoretically, the BECCS process removes some amount of CO2 from the atmosphere that has been converted to plant material through the process of photosynthesis. So we are entitled, at the very least, so look for inputs to the inputs, as it were, and outputs from the outputs. And if we do that, we immediately discover problems. Given the need to remove several gigatonnes of CO22 from the atmosphere using BECCS, very large amounts of biomass would be required. 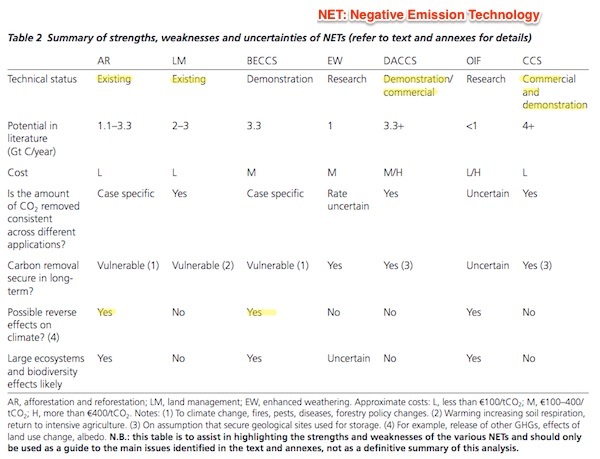 In their 2015 review of [Negative Emission Technology (NET) like carbon removal], the National Academy of Sciences (National Research Council, 2015) assessed the land, water and nutrient requirements of dedicated energy crops. They estimated that producing 100 EJ/year (EJ, exajoule: 1018 joules) (approximately 20% of global energy production) could require up to 5% of the current land surface (excluding Greenland and Antarctica) – 500 million hectares22 – on the assumption that approximately 10 tons of dry biomass are produced per hectare annually. 22 500 million hectares: 1.5 times the size of India. Most assessments for sustainable bioenergy crop production use abandoned agriculturalland, degraded land, marginal land and waste land unused agricultural lands, which is estimated to be between 320 and 580 Mha of low productivity land. Chum et al. argued that although using marginal lands for bioenergy production is often seen as an option to avoid land use change, its low productivity, long distance to bioenergy plants, loss of biodiversity and the competitive use of land by the local communities, could be a challenge. In addition, remoteness of marginal lands and their long distance from the centralised bioenergy facilities may result in logistic and economic challenges. 2017 in Portugal will be remembered for extreme heat waves, severe drought, and catastrophic forest fires. Half a million hectares of land burned, equivalent to 5 percent of the national territory the greatest yearly total in the country’s history. [Portugal] has more land planted with eucalyptus than any other EU country. Concentrated in the northern and central regions, roughly 10 percent of Portugal’s land area is planted with Eucalyptus globulus, an exotic, highly invasive, fast-growing subtropical tree…. The harm caused by fires in Portugal in 2017 was unprecedented. On June 17, 64 people lost their lives near Pedrogão Grande, in the district of Coimbra, central Portugal, in what has been described as Europe’s first “firestorm.” Climatic conditions conspired to create an inferno that eventually covered almost 50,000 hectares in one fire alone. In the days before the fire, temperatures had reached over 40 degrees during a heat wave, with much of the country already experiencing severe to extreme drought conditions. A dry lightning storm ignited multiple fires, and strong winds quickly spread the fires across a huge area. The extreme heat wave in Southern Europe in June 2017 has been clearly linked to climate change, with researchers finding that the conditions in Portugal were ten times more likely to have occurred due to global warming. Fires raged throughout the summer, culminating in a second firestorm on October 15, in which another 45 people lost their lives. This time, Portugal’s burned area doubled in size overnight, with fires sweeping across huge areas of central and northern Portugal [Sound familiar?] .Satellite mapping of the infamous Pedrogão fire has shown that eucalyptus and pine plantations covered around 70% of the burned area, and that these areas experienced high fire severity. OK, you say, we’ll plant trees that don’t catch on fire, even with high(er) winds and hot(ter) temperatures. Fine, but monocultures are also not resilient against birds, bugs, fungus, bacteria, viruses, you name it, because when one individual goes, they all go (absent toxic chemicals from Monsanto, and so forth.). Not enough land, bio-energy crops that could end up like your tomatoes when blight hits. So the input site of BECCS looks like an enormous and extremely vulnerable single point of failure. Now let’s turn to the output side, and see if BECCS fares any better. Injection wells are designed to hold the wastewater created by drilling many wells—for that reason, far more water goes into a deep injection well than into a fracked gas or oil well. The researchers found that the pressure created by pumping millions upon millions of gallons underground seemed to put extra pressure on nearby fault lines—so much so that when major quakes struck thousands of miles away, like the March 2011 quake in northern Japan that caused an epic tsunami, the resulting seismic waves could trigger swarms of small quakes near the injection sites. It’s the injection wells—not the fracking per se—that are specifically linked to those temblors in this study. Are you comfortable that CO2 won’t get back into the biosphere through newly introduced fault lines or fractures? I’m not. The biomass plantation, under current politico-economic constraints, will be run by profit-making entities. Are you comfortable there won’t be “fluid leakage” of liquid CO2? I’m not. In sum, BECCS may be able to capture carbon. But will it stay captured? As you can see, afforestation and reforestation (AR) and LM (Land Management) are “existing” approaches, and Direct air capture and carbon storage (DACCS) and Carbon capture and storage (CCS) are demonstrations or commercial. Only BECCS is purely at the demonstration stage. So, why BECCS? I confess myself baffled. One factor possibly contributing to a lack of urgency may be the belief that somehow ‘technology’ will come to the rescue. The present report shows that such expectations may be seriously over-optimistic… Whether consciously or subconsciously, thinking that technology will come to the rescue if we fail to sufficiently mitigate may be an attractive vision. If such technologies are seen as a potential fail-safe or backup measure, they could influence priorities on shorter-term mitigation strategies, since the promise of future cost-effective removal technologies is politically more appealing than engaging in rapid and deep mitigation policies now. Placing an unrealistic expectation on such technologies could thus have irreversibly damaging consequences on future generations in the event of them failing to deliver. This would be a moral hazard which would be the antithesis of sustainable development. It feels to me like betting the biosphere on BECCS is unlikely to pay off. And waiting for it to do so is akin to planning to win the lottery as the way to pay your bills. As a concluding sidebar, despite my breezy and polemic tone, I know that global warming — or global weirding, if you want to factor in stuff like insects disappearing — is important; it’s an evolutionary chokepoint, and I feel we should get as many people as possible through it (and not just elites, as the wealthy would have it, or the deserving, as professionals would have it.) So I welcome commentary from the many readers who are more expert on convulsions in the biosphere than I am. If BECCS is a good bet, I’ll be happy. But I don’t think it is. Thank you. One obvious task for a Green New Deal. This entry was posted in Energy markets, Environment, Free markets and their discontents, Global warming on November 29, 2018 by Lambert Strether. 1. It is not true that if 10 or 100 acres of land do something good, 10 or 100 million acres of land will do a million times more good. Ask Gulf Oil about their experience. You may extrapolate to 150 or perhaps 200% of your figures, but everything beyond is not extrapolation, but imagination. 2. Their is a big “error” in your figures 2 and 3, as the BECCS inputs are in some countries, but the outputs are in other countries, and the CO2 storage in still other countries. I think in the end only rent extraction will remain, with little to no net energy storage. 3. BECCS is only the second requirement. The very first requirement is a reduction of emissions, and even if we reduced emissions to near-nil, we’d still need BECCS (or an alternative) on top of it, because we are already beyond the 1,5°C limit. This BECCS stuff stinks as an excuse to not act now, as we will have BECCS tomorrow. >The BECCS inputs are in some countries, but the outputs are in other countries, and the CO2 storage in still other countries. I think in the end only rent extraction will remain, with little to no net energy storage. The diagram is a forcing device, saying “Let’s see how linear this system really is,” not a schematic. That said, I agree on the rent extraction, but I don’t understand why a single integrated system wouldn’t be on one continent. (OK, maybe the land suitable for the plantation would be remote from the correct geology for burying the CO2, but I don’t see that argument being made anywhere.) Alternatively, we’re shipping liquid CO2 all over creation, and I don’t see anyone factoring the carbon for doing that into the figures, either. Thank you for giving me an opportunity to restate my initial answer. As explained longer form in the many very good answers further down, there are none (or a few manageable) issues with the power generation part. But why would anyone invest in working infrastructure to remove the carbon dioxide? There are as far as I know no identified solutions to e.g. treat the fracking wastewater, treat the leftovers from oil extraction in tar sands, etc. And even if the Government would invest and pay (with what money – we don’t have any money left, you can hear them coming), you’d end up with the F35 of renewables: a Rube Goldberg device as Carolinian said, without much actual output. And as you say, I don’t know if anyone has calculated (in meaningful terms) the equivalent of oil’s EROEI: while for oil we look at the amount of energy (or barrels) put in the market per barrel of oil invested in the extraction, for CO2 sequestering we should look at the amount of CO2 generated per ton of CO2 sequestered. First off, the issue of monoculture for energy crops is not that serious for cooler climate trees. Its quite possible to use multiple hybrid varieties and mix species – this is common arboricultural practice where you don’t have to plant for easy harvest, and for energy cropping there wouldn’t really be a reason to have only one species. In any event, if a disease was to sweep through, for example, mass stands of coppiced hazel for energy, you could simply cut them all down, use the wood for energy, and then plant lots of some other appropriate species without necessarily interrupting the cycle. The biggest problem would probably be choosing the right species, when you don’t know what the local climate will be in 10 years time. This is already a serious problem for farmers planting, say, avocado or lemon trees. Another point about trees is that they don’t have to be single-use crops. Many suitable bioenergy trees also produce excellent byproducts for other uses – for example, hazelnuts or sweet chestnuts (palm oil actually produces a vast amount of waste shells which are an excellent source of energy biomass as they are very dry and easy to burn). Others, as varied as beech or bamboo (ok, the latter is not a tree), can be used to make fabrics and other products. So if, say, you displaced cotton plantations with bamboo plantations you could have your climactic cake and eat it, as Boris Johnson might say. Its also worth pointing out that there is a very long human history of mixing biofuel sources (i.e. trees for firewood) with conventional agriculture. So there is really no need to imagine vast forests of monoculture displacing huge areas (at least not everywhere). Setting rules that, for example, all of a certain type of farm should have 20% of its land use in coppiced woodland would be both achievable and would have lots of other benefits in many agricultural areas (not least for promoting agriculturally beneficial insects). Not all forms of CO2 storage are problematic. The use of biochar as a storage material in soils has thousands of years of history. It can be confidently stated that it will hold CO2 within most soils (while improving soil structure) for thousands of years. This would however mean an investment in small scale biochar (i.e. gassification) plants rather than using the existing thermal plant network, which is potentially very expensive, although arguably a better mix with a focus on decentralised networks and renewables. Mixing in Olivine with biochar could also potentially be an excellent and relatively straightforward means of improving soils ability to store CO2, in the medium term at least. Another (if somewhat geologically limited) form of CO2 storage is using natural mineralisation processes within basalt. The CO2 mineralises within the fractures within a few years, forming a stable substrate. How much suitable geology is available however, is a very big, unanswered question. I am sceptical about whether BECCS – at least as presented in the IPPC report – is an answer. But that is not to say that within the broader definition (i.e. getting away from the crude model of treating CO2 as if it is some sort of waste fluid), it does not include some relatively cheap, proven, and highly effective methods for removing or displacing a significant amount of CO2. This: “…Setting rules that, for example, all of a certain type of farm should have 20% of its land use in coppiced woodland would be both achievable and would have lots of other benefits in many agricultural areas (not least for promoting agriculturally beneficial insects). ” is great. it’s also what I’ve been shooting for, since we heat with wood. IDK what the net carbon emmissions are, nor how to find out, really. and biochar, too…I’ve played with that a bit. my fall/winter practice…which I’ve been damaging myself with today…is pulling and piling all the damned native sunflowers before they dry out too much(thus spreading a million seeds)…letting the piles dry…and then burning them at the next rain. the process I’ve developed ends up with a bunch of charcoal from the woody parts of the sunflowers, which goes into the garden beds to be stomped and worked in. I remove these so they won’t grow next year at those spots…they’re alelopathic(nothing grows under them(a quality I exploit by planting them in those parts of the pasture that still have stickerburs)), nothing but doves eat them, and they make it hard to mow(fire breaks, etc). adding charcoal hasn’t had time to show any results, yet. everything I’ve seen says it’s great for the dirt. I’ve been planning a retort for turning the bamboo stand into blacksmithing coal for years…I assume it could be used for this, as well…although, again, I have no idea about the numbers on net emissions. I don’t see how any single source of any renewable energy is going to work – at least not everywhere. I live in Upstate NY near Lake Ontario. From about now until April the skies are nearly completely overcast as prevailing winds off the lake grab moisture and form almost continuous clouds – sunny skies are noteworthy here this time of year, it’s also why we get 100” of snow per year. It’s 100% overcast today and almost no wind. Unless we’re talking hydro or nuclear I’m at a loss as to energy sources. Even indigenous people in this area used biomass almost continuously. As I recall reading a study almost 30 years ago… one interesting finding was missing carbon emissions. Per the study at the time one of the great missed sequesters was the reforestation of the eastern US. In 1920 something like 90% of the eastern US was deforested. Once that stopped forests regrew but it also meant the average age of any tree was young relative to the same forest 500 years prior. Young trees grow faster and sequester more carbon. Young forests sequester more carbon than old forests. In areas appropriate why not mine forests to keep them younger while also harvesting the energy and carbon? It’s obviously not a 1 off solution but you’d have to be dense to not see that there is no one answer to climate change or our energy needs. I think your last point about secondary forest is very important. Pretty much all the forest of the east coast of the US dates from the collapse of agriculture (or more precisely its shift west) in the early 20th century. Even in South and Central American a lot of what people think is pristine jungle is actually quite recent secondary forest. Simply cutting such secondary forest in cycles and just leaving the timber on the ground to rot into soil naturally would be a very cheap and potentially a very rapid way to sequester carbon. From memory, most trees take in the majority of their carbon in the first 15-20 years of growth, so this points to the ideal cycle rate. I don’t know if this has ever been followed up, but I recall years ago reading in New Scientist a theory that the little Ice Age of the 18th Century was actually caused by natural afforestation in North America as Native American populations were wiped out by introduced diseases. I suspect that if the downed trees were left on the surface to rot, they would decay all the way down to water and carbon dioxide as all the Cs and Hs in the cellulose and lignins separated from eachother and oxidized all the way down. But growing plants and trees above the rotting trunks would be spreading out their leaves in a sun-catching layer, and this layer of leaves would also be able to intercept CO2 rising up from the rotting logs below. So not all the CO2 released from the rotting logs would go into the general atmosphere. Some of it would go right back into the rising generation of new trees. Would these trees be hosting mycorrhizae? Many temperate zone trees do host mycorrhizae. The trees feed the mycorrhizae by shipping liquid carbon compounds ( sugars) down into the roots and out into the mycorrhizae surrounding the roots. The mycos burn part of this sugar on their own growth and survival and part of it on gathering minerals from soil and shipping those minerals back up into the roots for the tree to use for more growth and more sunlight-fueled aircarbon-capture. The mycos don’t burn all the sugar-root-juice they receive all the way down to CO2 and H2O. They leave behind a residue of decay-resistant semi-permanent humus compounds in the soil. Those compounds represent carbon storage in the soil. So even though the downed logs decay all the way down to water, CO2 and slight mineral residue, the next relay of trees are intercepting much of the rotting-log-released CO2 and injecting some of it down into the soil where ” some of that some” remains as long-term carbon-storing humus. Its a roundabout way but it works. Such is my amateur-level science-buff understanding. If someone in a real position to really know sees flaws in my understanding, hopefully they will point those flaws out. The Amazon Indian Nations did not just leave the downed logs to rot. They carefully burned them under semi-hypoxic conditions, such that a lot of hard carbon ( with slight mineral residue in it) was left behind as essentially charcoal. Hey! BioChar! Which they then either mixed into the soil or maybe just let it build up on the surface for burrowing creatures of the forest to mix into the soil. That got even more hard-carbon of an even more decay resistant nature into the soil for long time periods. So drop-and-char might be better than drop-and-rot. A lot of different people and groups each know a little bit apiece about coppicing. There are a couple of authors who say they are travelling the world and researching all its scattered coppicing systems and informational ammo-dumps They say they are going to put a huge amount of this information into one place and publish it as a book. Here is their website. Sadly, humans were experts at this, but so much knowledge has been lost. Thankfully, its not exactly rocket science (I saw that as someone who has done plenty of coppicing and pollarding in the past). Just make a clean cut at the right level (this depends on the species) and let nature do its thing. That is why these two authors are doing all this research in order to put out the book they say they are going to put out . . . . so the nearly-lost knowledge can be found again . . . and maybe viralized and disseminated to those hopefully many thousands who would re-learn and re-practice the knowledge. And hold it in ready-reserve for just in case the broader society wants it. There is if you’re a profit-making entity, right? I do agree that there are a lot more elegant* and productive ways to think about trees and biofuel and horticulture than BECCS. (Amazonia, for example, an enormous success still giving back today, was IIRC biochar-based (terra preta, per 1491). But with BECCS as a deus ex machina, those avenues are less likely to be explored. * By “elegant,” I mean getting the biosphere to work with us, instead of bolting on an enormous add-on like BECCS. I think one problem with BCSS is the insistence that biofuels be used as the ‘middle’ part of the cycle. This implies a huge investment in either new thermal or gasification plants, or (more problematically), converting existing plants. It is, in short, the power generation aspect which is expensive and technically difficult, not the growing things or storing CO2 part. Plants have been doing this for, like millions of years. A very good example is the gradual conversion of peat burning power plants in Ireland. They’ve been researching the use of biomass for decades – essentially looking at growing willow or other trees in coppice to burn in those plants rather than peat (or turf, as we call it in Ireland). In theory this is easy – in reality, its proven very difficult to get the right mix of biomass to burn in thermal plants designed for a specific fuel. They have to import palm oil shells from Indonesia (a waste product there, but expensive to ship) in order to reduce the moisture level of the biomass to an acceptable level. Its proven very expensive. One estimate is that it would have been cheaper to close down the entire programme but keep paying the staff for 10 years. In short, focusing on the bits we know – i.e. growing lots of biomass takes in CO2 – and then concentrate on the sequestration parts we know work – biochar, compost, etc. For power generation, focus on what we know can be scaled up quickly and economically – wind and solar mainly. This means in practice only using biomass for local schemes (home fuel, small scale boilers, additions to fossil fuel feedstock in existing thermal plants), and use the rest for compost or biochar, or just log trees and leave them to break down naturally on forest floors (now there is a good application for a jobs guarantee). Actually, on this point, I think the driver for a tech led ‘big project’ approach is less profits, than a particular engineering/management* mentality. For example, it took decades to persuade the flood engineering profession to accept that smaller scale upstream interventions (SUDS), were far more cost effective methods than building huge flood barriers everywhere. Its now accepted within the profession, but it literally took a generation to drive out the old ways of thinking. Likewise, trying to persuade transport engineers that maybe building highways everywhere isn’t always the right solution is surprisingly hard and still a work in progress. Thats not to say that financial interests aren’t driving certain ‘solutions’, but in my experience the problem is lower down the chain, and more due to a particular mindset. “Earth’s CO2 Could Spike to a Level Not Seen Since the Dinosaurs”! Scientists are still trying to figure out what that might mean for life on Earth? Hmmmmm……”Scientists are still trying to figure out what that might mean for life on Earth?”…………..My smart grand-kids (6 yo, 4yo) love Dinosaurs. I’ll ask them……….? …………………………………………………………………Ahaaa, an answer! ……….They (grandkids) told me that Earth was covered with teaming, diverse life. Animals, plants, fish, insects. Creature could be gigantic- far far bigger than anything we see today. “An Arctic free of ice and stocked with swamp-loving reptiles. Temperate forests covering Antarctica, thriving on heat that kept them alive through the dark months. Average temperatures along the equator of about 100 degrees Fahrenheit. My concern is with mutagenic chemicals and practices (gene splicing), that are being released, without restraint, into the biosphere. There are shelves, stacked with Round-Up (Glyphosate), in my local grocery store! I’m worried about that, too. We could be looking in entirely the wrong place, at carbon production as such, as opposed to (say) an enormous loss of biological activity and mass in the form of insect extinction (which I’m speculating is due to trace amounts of insecticides in literally everything). We may not have the luxury of deciding which one of several places to focus our looking-in on. We may have to look at them all at the same time. I read recently an interview with an entomologist about the spreading threat of neonics. Pesticide-design chemists and engineers were very pleased at how little harm neonics did directly to birds and mammals exposed to smallish traces of them. They appear to not care to know how very deadly they are to the brain-cells of insects, and have preferred to not think about the ability of neonics to spread from the plants they are applied to . . . into the soil . . . and then up into other plants. Where insects of all kinds eat the plant parts or the pollen or the nectar or other insects who have eaten these things. This entomologist thinks it is the neonics specifically which are being the ongoing Bonfire of All the Insects all over the earth. If I can find the entomologist’s name, I will bring it in. Too hot for big mammals. Mass heat-stroke death for people, probably. The return of a New Age of Reptiles, Insects, Amphibians. The Mesozoic 2.0 Age. Lambert’s questions cannot be easily answered. I don’t have the answers indeed and I think nobody has the answers for a problem of this magnitude. Nevertheless I have an opinion, regarding long term carbon storage. For me the question is not exactly how secure or certain is that storage. The question is to have BECCS capacity that is able to capture the leaks that will or would almost certainly occur. And my answer for that is that if BECCS can be scaled up to reduce atmospheric carbon to pre-industrial levels, it will, almost certainly, be enough to capture leaks of already stored carbon, because I wouldn’t expect those leaks to be larger than, for instance, current fossil-fuel related CO2 emissions. > I wouldn’t expect those leaks to be larger than, for instance, current fossil-fuel related CO2 emissions. Good argument, though we don’t know. I don’t know what happens when liquid CO2 is underground. (Now that I think of it, exactly as with fracking, we probably need to ask what other additives there will be to the liquid CO2). If you store it in the form of biomass the question is how much of it undergoes the process of biological aerobial/anaerobial degradation resulting in CO2 and/or methane that can leak back to the atmosphere as it occurs in the natural carbon cycle. Surely you can develop methods ensuring that such degradation is limited and slow. And of course biochar will last many centuries inertly undecayed in the soil it is mixed into. And in fact as I read slower this article I re-realize that glomalin is not “just” a humus “precursor”. It is a long-lasting hard-wearing durable organic molecule bi-complex with carbon-storage talents of its own. It’s such a shame that we are literally going to kill off our own species, and most of the rest of life on this planet, by choice. It’s also a lot of water, which is probably the more limited resource. +1 +1. Between the clearing of land (and destruction of ecosystems/habitats), use of incredible amounts of fertilizer, and water, I think the water is what would really make BECCS impossible. Goodbye, groundwater. Lambert, what page in the summary is that table on? This is awesome, thank you for writing it. BECCS should be thought of as a pipe dream and the fact that no one has made a convincing demonstration of it is very telling. I think a major driver of BECCS over other negative emissions technologies is the drive to put the human-added CO2 out of the system at geologic timescales. A deep fear of re-forestation, soil carbon additions, wetland restoration, etc. as the only carbon sequestration strategies is that forest fires, insects, droughts, etc. could all easily wipe out gains in any of those carbon stocks in a space of weeks (fires) to decades (drought). Either way I think the right perspective on the natural climate solutions is that we have to do those things *because they are the right thing to do*, not just because they will take CO2 out of the air. As an aside, here is a brutal and short rejoinder to the idea of using silicates to draw CO2 out of the air at significant scales: https://twitter.com/KenCaldeira/status/965703007315742725. Thank you. I also didn’t work in the fact that a biomass boiler was the vehicle to “save the mill” and ended up being the hook for a corrupt deal that brought in the landfill. “Biomass” turned out to mean construction debris trucked up from Massachusetts and dumped in Maine, not just woodchips from the mill. So I’m a little jaundiced about the technical milieu. Westinghouse gave my city several superfund sites, then said they’d build an incinerator to take care of that, all trash-fueled. Then the fine print showed the local gvt would have to pay Westinghouse if not enough ‘fuel’ was provided, ie we’d’ve been a trash destination for miles around. It really demands upon power plant. There are a lot of biomass plants that burn really nasty stuff, construction and demolition (C&D) is sometimes the cleanest part. I’m talking about facilities that burn old furniture, telephone poles and railroad ties. Because they’re considered biomass, these plants often has less stringent pollution controls than coal or waste-to-energy facilities and release the harmful chemicals went burnt. However, many plants burn agriculture pruinings, limbs to small lumber or paper mills, and sawdust and other clippings. And some, as you mention, burn both, which exacerbates many of the regulatory problems. Here’s some discussion of biomass without the carbon capture. Burning wood creates lots of particulate pollutants and as my neighbors crank up their fireplaces and the neighborhood takes on the sharp tang of woodsmoke it’s a mixed blessing. Of course high efficiency wood burning and carbon capture may create a somewhat different situation but if smokestack carbon capture is so great then why not just burn coal? Presumably the theory is that removing the trees and then regrowing them will provide a continuous if very slow method of taking carbon out of the atmosphere. Of course as Lambert says one could just leave the trees and grow the new trees somewhere else–aka reforestation. BECCS sounds like something Rube Goldberg would approve of. Given that massive deforestation is continuing and accelerating in much of the world, it’s hardly clear that a pseudosolution requiring that much forest is doable even by capitalist logic. Suspect much of this is driven by political unwillingness to implement any significant usage reduction/nonhydrocarbon production. Monthly Review has actually had a lot of good environment and climate change material in recent years. BECCS is what you get from people who are either politically or economically stymied from pushing more obvious solutions, but who are also obligated to show signs of trying. Plus people who see a possible gravy train. Lambert, and others, you may be interested in the book “Drawdown.” It ranks the 100 solutions to solve global climate change. It is an amazing book. I bought it earlier this year and have been impressed with the level of research that has gone into it. And the website means that you don’t actually have to buy the book, though I have really appreciated having my own copy. Interestingly, Drawdown doesn’t mention BECCS specifically anywhere. Though Biochar is listed as solution number 72. Another recommend for that book, its excellent. As you say, the book rightly doesn’t give much attention to carbon capture, although it does overlook recent interesting research on storing carbon in fractured basalt, where natural mineralisation processes should lock it in permanently. Serious but admittedly uninformed question: there’s no way to “afforest” the ocean, like with algae or helping ocean ecosystems to grow or recover? There has been at least one thought experiment along those lines. It became, as a movie, “Soylent Green,” derived from Harry Harrison’s book, Make Room! Make Room!. https://en.m.wikipedia.org/wiki/Make_Room!_Make_Room! The main answer to that is that while theoretically its very promising, the small number of tests carried out didn’t work as expected (and they are illegal now, as technically its dumping at sea). It may be more promising to look at very specific areas (such as off British Columbia or Peru) to boost fish stocks in a sustainable manner. I suspect there are too many unknowns to make it a ‘solution’, but localised projects may well prove beneficial. CO2 storage by making carbonates is much safer long term. One has to make it cheaper though. This is a very good summary. Thank you. As to the question, “Why the BECCS?” my spidey sense says this is a re-branding of ‘clean coal’ because it’s to be co-fired with the plant material. The addition of plant matter is different in this iteration but turning that much biomass into electricity does not make sense. Carbon Capture and Sequestration sounds more legit than Clean Coal, Suckers! They tried to sell fracking as a bridge, too. I am afraid that all expensive, large-scale projects will fail because of political reasons. The great powers are at loggerheads with each other. It will be increasingly difficult to allocate the resources to make BECCS work across several countries. Regardless of the flaws in the technology. The only thing that nations, corporations and voters will accept is a silver bullet, and possibly a cheap one. I am betting on geo-engineering. Geo-engineering by stratosulfate injection, I suppose. Yes, geo-engineering by injecting sulfates in the stratosphere. I am not saying that I second that or that it is a good idea. Actually, I am pretty sure it is a terrible idea, that is more likely to go wrong than right, and will not solve any of our other problems (overfishing, biodiversity loss, topsoil loss, ocean acidification, deforestation, overpopulation and so on). What I am saying is that our societies, and the international community, are too divided to implement anything on a scale remotely close to what BECCS would require in order to work. Geo-engineering is ridiculously cheap. Tax-payers would not even notice that they are paying for it. No lifestyle change required, no international treaty. Just a couple of airplanes taking off every now and then… until eternity. In the end, it will be the only politically acceptable option left, so it will be tried. My suspicion is that geoengineering will be done quicker than we think, and it will be done by the Chinese. They have the resources, and they have most to gain and least to lose according to the projections I’ve seen. All we can hope is that they get it right (but like you, I’m pretty sure its a terrible idea). So the IPCC’s response to our inadvertent, but not unknowing, geoengineering aka *anthropo-genic global warming, is a non-existent method of… more of the same? I’m glad you focused on the performance of injection wells. The tech/earth boundary is always the most interesting. They’re never as impermeable as imagined, especially not over the necessary time scales. The well linings already don’t work, but BECCS somehow will? We’ve over-relied on engineering our relationship with nature already. That’s the problem. Pretending some man-made miracle will make nature do as we say, has been our vanity all along. It’s a holodeck solution from people who think they’re living in a holodeck world. Before I get too blue, thanks for the Stephanie Kelton Green New Deal link. At least there’s that. Deep well injection was a waste disposal solution used by the chemical industry. It was discarded/banned in the 70s/80s because of water table contamination and earthquakes, so why the **** the frackers ever thought it was an awesome idea is beyond me. Carbon capture is extremely expensive and unproven. The amount of energy required to separate and compress CO2 out of an exhaust stream will reduce the overall energy efficiency of a gas fired power plant from, say 35% to, uh, 15? Maybe 10? And cost billions of dollars. Some brainiacs are injecting CO2 in the deep ocean where it liquefies due to the extreme water pressure. And it stays there forever or at least until an underwater event (earthquake, volcanic activity) causes it all to bubble up suddenly. So yeah, 100% guarantee on that. My favourite idea is using atmospheric particulate pollution to cause global cooling by blocking the sun in an impenetrable, global cloud of smog. As an asthmatic I know that’s got to be good. And the fastest way to put millions of tonnes of dust into the atmosphere is, of course, nuclear war. See, it all fits! You maniacs, you blew it all up!